Earlier in the week I posted a tutorial on how to draw buildings with the pen tool. But sometimes drawing each building just takes too long. For whole cities, you probably want a quick way to lay in whole blocks of buildings. Photoshop can help – using dynamic brushes. Here’s the settings for the brush I’m using. Start with a square brush. Add jitter and shape dynamics. When you’re using the brush you should vary the spacing, size and amount of jitter on the brushes. This will give you difference in the shapes and sizes of buildings that will suggest the difference in the socio-economic status of the different districts. To lay in the buildings, either freehand along the sides of the roads, or click and then shift-click to lay in straight lines of buildings. At this stage – don’t worry about going over onto the roads. We’ll handle that later. We create a mask on the buildings layer. Select pixels on your roads to get a roads selection. At this point you have a choice. The quick route is to select the buildings mask (option+click the icon), and then stroke the selection (Edit->Stroke…). The problem with this is that you end up with curved edges on the mask which doesn’t look great. A better way is the following – take your roads selection and then use Selection->Path to generate a path along your roads. Now, stroke the path with a rectangular brush. In this case we want the rectangular brush to go along the path, with no jitter and small roundness jitter. Option-Click the layer mask on the buildings, and stroke the roads with the brush. In panel 3 you can see the result of stroking the roads. With the mask in place the blocks are now confined within the city blocks and you’re done! 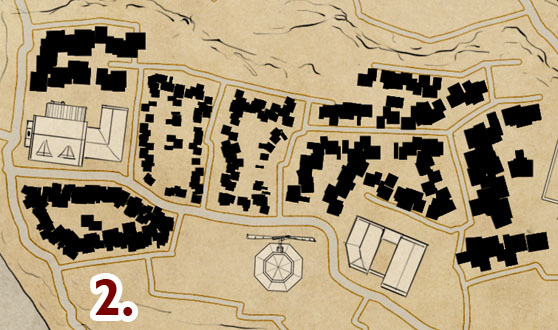 A couple of notes – here I’m using my current work in progress town map – obviously the featured buildings are a totally different scale and can’t co-exist on the same map! Second – these styles of blocks work best when you’re going to view them quite zoomed out. I’d suggest that this works best if the image above was your working resolution, and the final scale was 1/3 of what you see there. Finally, a word on styling – here I’m leaving the houses as black silhouettes. Later in the week I’ll show you how you can style these silhouettes to make them integrate into your map. I really appreciate these tutorials. I don’t get to use Photoshop as much as I would like to at work so some of the techniques you share fill in some knowledge gaps for me, remind me of things I had forgotten, and even give me ideas for things that I might try in Illustrator. So, while it’s inspirational seeing what you do with maps, following your blog helps me at work, too. Thank you!!! You’re welcome – and I’d love to see the custom building brushes you knock together! I have to say illustrator is still a bit of a foreign land to me. What’s the day job? Technically, I’m a “visual information specialist” with the U.S. Navy. I spent most of my time working on web design (after being an air warfare analyst for 20+ years) until most of that got pulled back to the D.C. area and I became a web portal monkey. So I switched to my current position in an graphic design/illustration group where I’ve done software testing, video creation using Final Cut Studio, technical writing and editing, some web design, some eBook design, and occasional graphic design/illustration work. (Trying to stay ahead of budget cutbacks.) So, sites like yours help make up for the lack of actual graphics work experience and give me an energy boost after a day of doing everything but graphics. Very cool. Happy to help – and to hear where these tips end up! Well, I tried duplicating your technique in Illustrator and fell somewhere in between your Photoshop dynamic brush and pen tool techniques as far as how quickly I could fill in buildings. 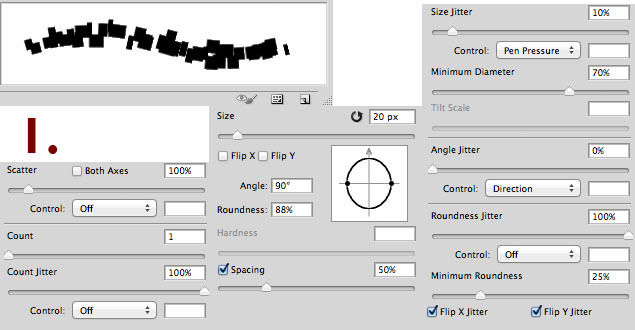 Illustrator brushes don’t seem to have nearly the dynamic ranges of those in Photoshop. I recreated your Map #2 above in Illustrator and then copied some of your buildings to create a vector pattern. I tried using them for an art brush but that distorted the buildings too much. I then tried just a pattern fill in a shape, expanded the shape, and then ungrouped the building elements to I could adjust them. That gave me a lot of buildings quickly but led to a lot of time spent moving them and adjusting their orientations. I then discovered the pattern brush and found that worked much more quickly. 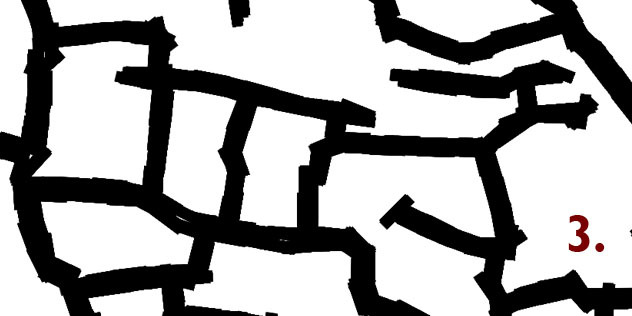 I made four strokes that were parallel to each of the bounding roads to orient the buildings and then expanded them to break the buildings into individual objects. It was relatively quick matter to do some quick deleting, duplicating, adjusting and combining to get a reasonably random-looking distribution of buildings. Here’s what I came up with using the pattern brush and also the pattern fill: http://www.andromedapacific.com/images/Buildings_Map_2_Vector_Redraw.png. This would probably work better if I had more time to work with the pattern a little more and also develop corner segments for the pattern brush. That looks brilliant! I’ll have to check out the pattern brush options in Illustrator – I’ve not tinkered with that at all yet. Don’t suppose you’ve had any thoughts about recreating these dynamic brushes in GIMP? Actually Gimp has a more powerful way of doing this – image pipes. But that’s a totally different post. Hello, fantastic tutorial, thanks so much. I was wondering if there is a way to replicate this effect in GIMP? The dynamic brush options there are quite basic from what I have seen. However, I cannot seem to find a post wich explains the integration. Can you point me out to the post, or -if you didn’t do so before- make a post adressing this? Ha, I should definitely write that process up 🙂 Let me take a run at that. Hi Jon, love your site. 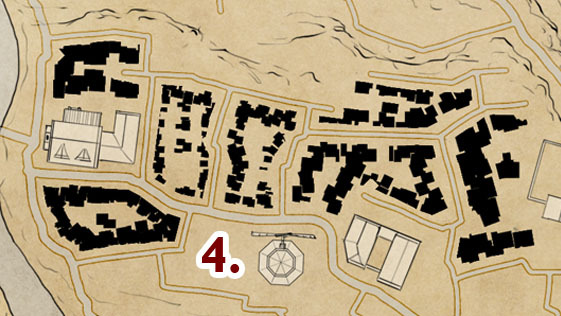 I don’t suppose you can take another look at making a tutorial on integrating the building silhouettes into the rest of the map? I tried figuring it out myself using the stroke tool but it didn’t turn out well. If there’s a better way to do this I’d love to know! 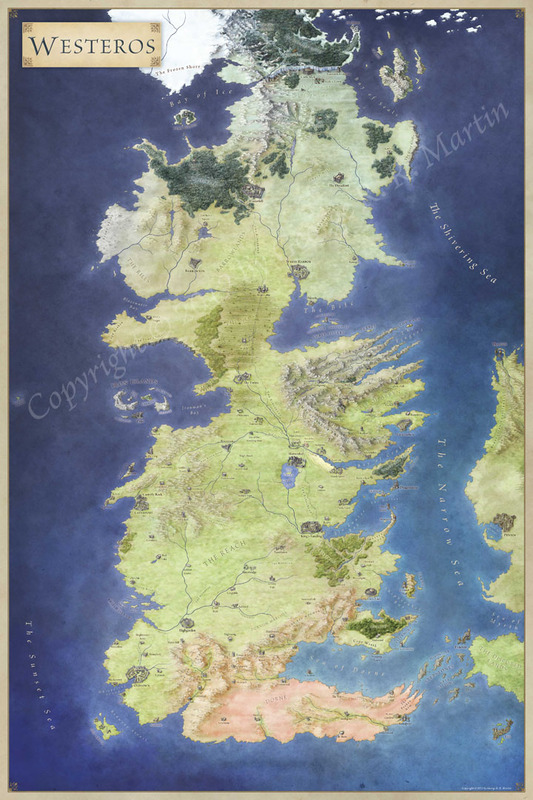 Thank you for your tutorials, I have your Westeros map hanging on my wall at work.